Ubivox collects time statistics for views and clicks for each of your newsletters. You can use these statistics to learn which topics your subscribers find interesting and what time of day they tend to read your newsletter. You can therefore find statistics on views and clicks, day by day and hour by hour, for all your newsletters. Click on Statistics -> Lists and select your list. Chose 24 hour view. This simple information inform you at which time of the day your subscribers are most active. If you look closely at the numbers, you can also see a connection between views and clicks by what time of the day they occur. You can also export this information into an Excel file if need be. 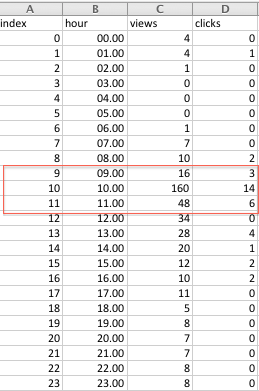 Below you see the number of views and clicks set up a table in Excel where another column is added manually, the click rate. In this example you can see that the subscribers are more active between 10 and 12 as this is were the best ratio between views and clicks are. Use your time statistics to plan when to send your newsletters in the future.